The United States Congress designated the Leatherwood Wilderness (map) in 1984 and it now has a total of 16,652 acres. All of this wilderness is located in Arkansas and is managed by the Forest Service. The Leatherwood Wilderness is bordered by the Buffalo National River Wilderness to the west. The Ozarks are known for their ridgetop country, and some of the loveliest specimens can be found in Leatherwood Wilderness. The Wilderness is named for the region's largest drainage, clear-flowing Leatherwood Creek, which runs across the northern portion and into the Buffalo River. Leatherwood Creek takes its name from a slow-growing shrub that produces pale yellow flowers in March and April; its extremely flexible wood has been dubbed "leatherwood." Steep V-shaped valleys separate the high ridges, valleys often sided with sheer rock walls or benches that drop in marvelous "stair-steps" to the drainages below. Glades of cedar hide among a forest of oak, gum, and hickory. White-tailed deer, wild turkeys, and black bears are known to live here, though they're seldom seen by the casual human visitor. What you will see are the ruins of old homesteads, farms, and roads that are slowly returning to a natural condition. 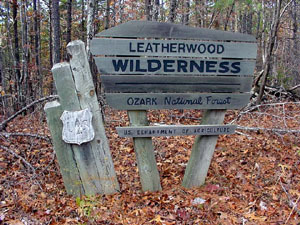 Leatherwood Wilderness shares its western border with the Lower Buffalo Wilderness Unit of Buffalo National River Wilderness. On the east lies Forest Service Road 1100 (Push Mountain Road) with several trailheads and one parking lot. From the parking lot, the trail winds up Spencer Hollow to eventually join Leatherwood Creek and trickle down to the Buffalo River. Hunting and fishing are allowed, camping is unrestricted, and horsepackers are allowed on trails in this area, the largest Wilderness in Arkansas. Planning to Visit the Leatherwood Wilderness? How to follow the seven standard Leave No Trace principles differs in different parts of the country (desert vs. Rocky Mountains). Click on any of the principles listed below to learn more about how they apply in the Leatherwood Wilderness.